(Nanowerk News) Until now, if you want to print a greeting card for a loved one, you can use colorful graphics, fancy typefaces or special paper to enhance it. But what if you could integrate paper-thin displays into the cards, which could be printed at home and which would be able to depict self-created symbols or even react to touch? Those only some of the options computer scientists in Saarbrücken can offer. They developed an approach that in the future will enable laypeople to print displays in any desired shape on various materials and therefore could change everyday life completely. For example: A postcard depicts an antique car. If you press a button, the back axle and the steering wheel rim light up in the same color. Two segments on a flexible display, which have the same shape as those parts of the car, can realize this effect. Computer scientists working with Jürgen Steimle printed the post card using an off-the-shelf inkjet printer. It is electro-luminescent: If it is connected to electric voltage, it emits light. This effect is also used to light car dashboards at night. Steimle is leader of the research group "Embodied Interaction" at the Cluster of Excellence "Multimodal Computing and Interaction". Simon Olberding is one of his researchers. "Until now, this was not possible", explains Olberding. "Displays were mass-produced, they were inflexible, they always had a rectangular shape." Olberding and Steimle want to change that. The process they developed works as follows: The user designs a digital template with programs like Microsoft Word or Powerpoint for the display he wants to create. By using the methods the computer scientists from Saarbrücken developed, called "Screen Printing" and "Conductive Inkjet Printing", the user can print those templates. Both approaches have strengths and weaknesses, but a single person can use them within either a few minutes or two to four hours. The printing results are relatively high-resolution displays with a thickness of only 0.1 millimeters. It costs around €20 to print on a DIN A4 page; the most expensive part is the special ink. Since the method can be used to print on materials like paper, synthetic material, leather, pottery, stone, metal and even wood, two-dimensional and even three-dimensional shapes can be realized. Their depiction can either consist of one segment (surface, shape, pattern, raster graphics), several segments or variously built-up matrixes. "We can even print touch-sensitive displays", says Olberding. The possibilities for the user are various: displays can be integrated into almost every object in daily life – users can print not only on paper objects, but also on furniture or decorative accessories, bags or wearable items. 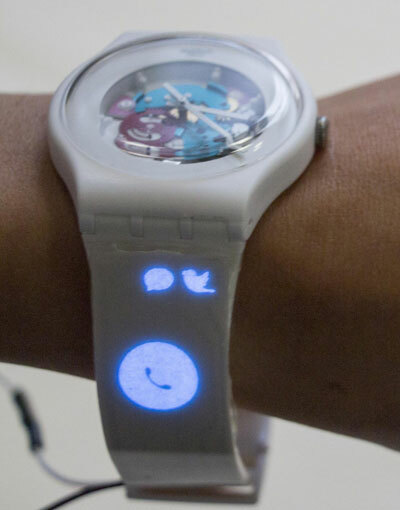 For example, the strap of a wristwatch could be upgraded so that it lights up if a text message is received. "If we combine our approach with 3D printing, we can print three-dimensional objects that display information and are touch-sensitive", explains Steimle.